How old must you be to do paragliding? 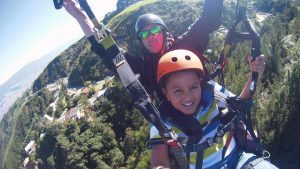 Portada » FAQs » How old must you be to do paragliding? How old must you be to fly in a paraglider? I am a minor. Can I do the activity? The activity can be done by children from 3 years old with prior authorization from their parents. The infants do the activity with a certified pilot and equipment in optimal conditions. Live the best experience with Gtopik, with the greatest satisfaction and security!